Update: Surprise! 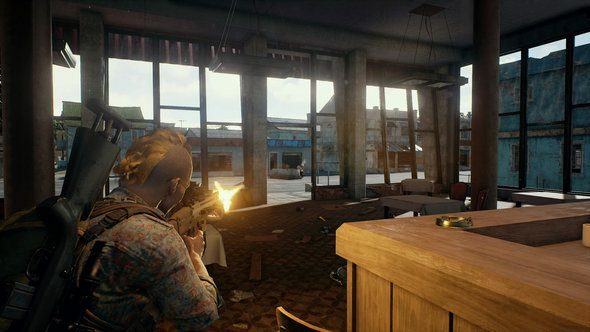 The delayed Battlegrounds patch isn’t delayed anymore. In fact, it’s live right now. It adds a silenced sniper rifle, a motorbike, new effects, better rendering, and – for the standout feature – more lobby vegetation. Get your rig ready for the battle royale with our list of the best CPUs for gaming. Fixed a bug that caused a player icon to be doubled up on the minimap. Fixed a bug where removing the pin from a grenade was canceled by changing the throwing posture. Original: Today’s intended update for PlayerUnknown’s Battlegrounds has been postponed until next week. The battle royale-style survival game has gained a significant following since its Early Access release in March, already selling over two million copies, with numbers of concurrent players sometimes exceeding 180,000. The patch itself was to be a sizeable one, fixing a large number of client side issues related to CPU usage, rendering of objects and foliage, and character animations. There was also to be a new sniper rifle and motorbike added to the game. If you want to get in on the Early Access, you can buy PlayerUnknown’s Battlegrounds on Steam for $29.99/£26.99. You can also check out the full patch notes over at the Steam community page.